Srinagar, April 05 (KMS): French journalist, Paul Comiti, has released his documentary exposing the massive genocide of the Kashmiris by Indian troops in occupied Kashmir. In the documentary “Kashmir: The War on the Roof of the World”, it was shown that the indiscriminate firing of bullets and pellets on the people were carried out on daily basis. New Delhi, April 05 (KMS): The General Secretary of Jawaharlal Nehru University Students Union, Aijaz Ahmed Rathar, has said that extending ban of advertisement to Urdu daily Kashmir Uzma after English dailies ‘Greater Kashmir’ and ‘Kashmir Reader’ by the authorities is a direct assault on the freedom of speech. Brussels, April 05 (KMS): The Chairman of Kashmir Council Europe (KCEU), Ali Raza Syed, met Pakistan’s Federal Minister for Human Rights, Dr Shireen Mazari, in Brussels, who is on a visit to Belgium these days. Srinagar, April 05 (KMS): In occupied Kashmir, protests and scuffle broke out between prisoners and prison authorities in Central Jail Srinagar, last night. Srinagar, April 04 (KMS): In occupied Kashmir, the Jammu and Kashmir Democratic Freedom Party (DFP) has strongly condemned the government ban on advertisements to the reputed dailies, Greater Kashmir, Kashmir Uzma and Kashmir Reader terming the move an attack on the media institutions. Srinagar, April 04 (KMS): In occupied Kashmir, Mirwaiz Umar Farooq-led Hurriyat forum terming the upcoming so-called Indian Parliamentary elections in the territory as a futile exercise has urged the people to stay away from the polling process as it can in no way help in resolution of the Kashmir dispute. Srinagar, April 4 (KMS): In occupied Kashmir, two Indian Air Force (IAF) officers including a squadron leader were killed while two others injured in a road accident in Pulwama district, today. The IAF officers of operational base were killed when the vehicle they were traveling in met an accident at Malangpora outside air force station in Awantipora area of the district, a police officer said. 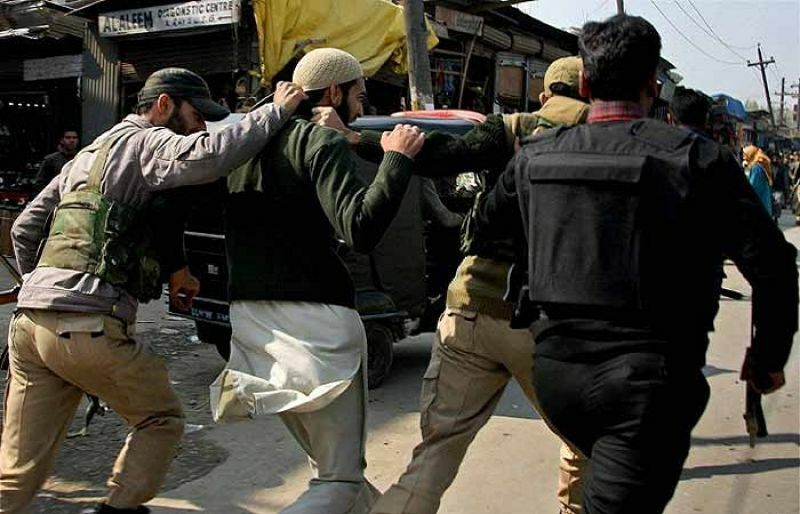 Srinagar, April 04 (KMS): In occupied Kashmir, Indian police arrested ten youth in Shopian and Srinagar areas. The police during cordon and search operations raided several houses in Vehil, Nowgam, Trenz and Choudrigund areas of Shopian and arrested nine youth. The arrested youth were identified as Umar Shafi Rathar, Aasif Malik, Faheem Shah, Aqib Shah, Adil Nazir, Anayatullah Malik, Tanveer Ahmed Wagay, Sajjad Ahmed Khan and Muzaffar Ahmed Mir. Srinagar, April 04 (KMS): In occupied Kashmir, the authorities have announced that there shall be no movement of civilian traffic on the Srinagar-Jammu Highway for two days every week.